My name is Neil Sattin, and I’m the author of NaturalDogBlog.com – the web’s most complete online resource for Natural Dog Training information. As a dog trainer who has worked with many dogs, large and small, I have searched for the best way to achieve control during training AND play, especially when working with dogs who don’t reliably come when called. It turns out that the BEST way is also the most obvious way: a really long leash. After experimenting with many different lengths, widths, materials, and colors, I can say without a doubt that the “best dog training leash” will give you peace-of-mind while you train and play with your dog. 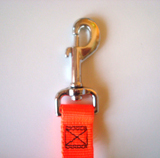 With the exception of the metal bolt-snaps (which are imported), these leashes are completely woven, dyed, and sewn here in the U.S.A. They are of an exceptionally high quality, and will last you many years of good times with your canine companions. Try out the Best Dog Training Leash for 30 days. If you're not completely satisfied, just return the leash to us, and we will refund the purchase price - no questions asked.